Laurits Andersen Ring (1854–1933), A View Over the Roofs at Sankt Jørgensbjerg, Denmark (1932), oil on canvas, 27 x 37 cm, location not known. Wikimedia Commons. 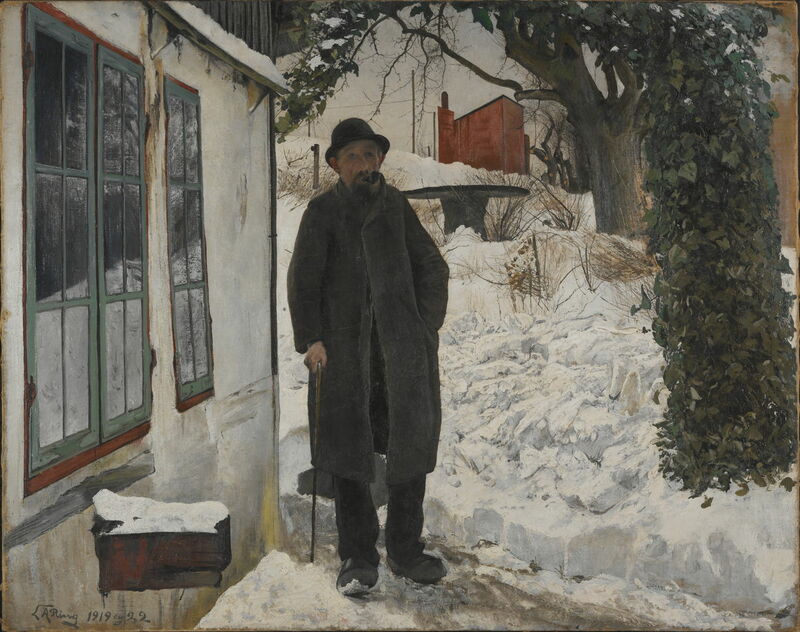 In 1915, Laurits Andersen Ring (1854–1933) celebrated his sixty-first birthday, and his first year of retirement to the house which had been built for him and his much younger family to the north-west of Roskilde, on the island of Sjælland (Zealand), Denmark. Roskilde is itself to the west of Copenhagen, and has the earliest brick-built Gothic cathedral in the Nordic countries, which has long been the burial place for Danish monarchs. Ring’s house in what was then the neighbouring village of Sankt Jørgensbjerg was ideally situated. Although generally flat and low country, here, around Roskilde Fjord, the land rises to 40 metres (130 feet) above the water of the fjord. Ring’s house and environs gave him fine views over the city, country, and the fjord itself to the north. It is these which dominate his work over the final eighteen years of his life. 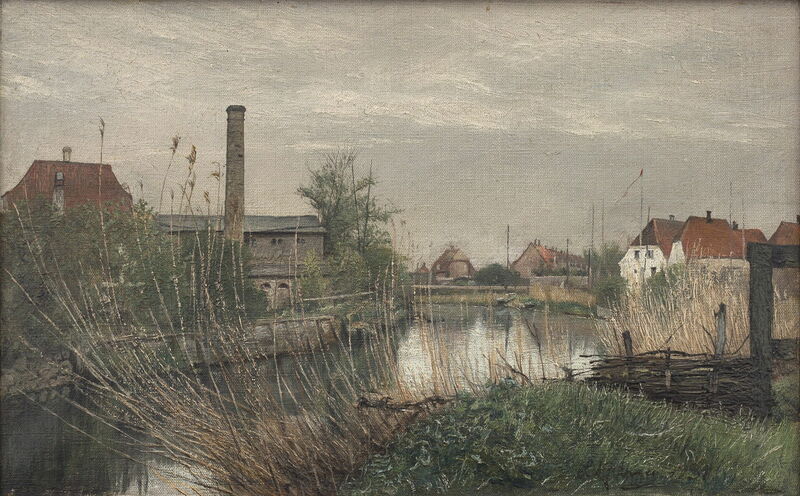 Laurits Andersen Ring (1854–1933), View of Sankt Jørgensbjerg and Roskilde Fjord. 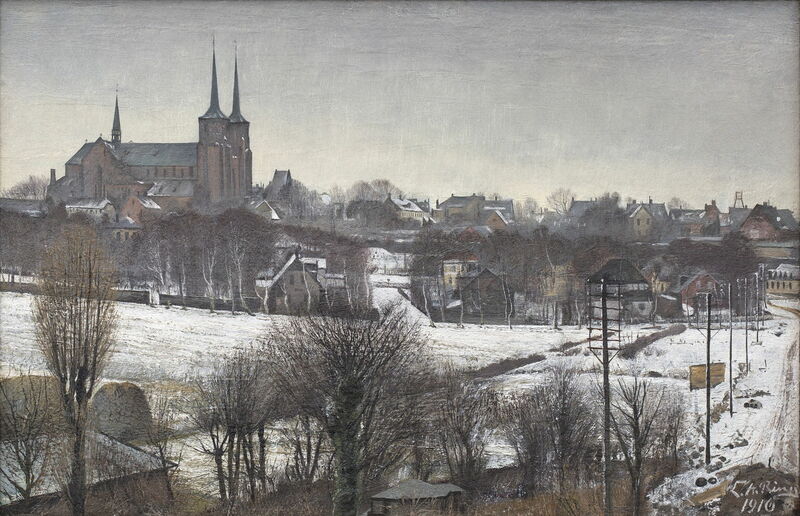 Winter (1915), oil on canvas mounted on wood, 18 x 25 cm, Statens Museum for Kunst (Den Kongelige Malerisamling), Copenhagen, Denmark. Wikimedia Commons. View of Sankt Jørgensbjerg and Roskilde Fjord. Winter is an early oil sketch of the view looking over the fjord, in 1915. Unlike his exhibition works from earlier, it is wonderfully loose and in parts quite gestural. 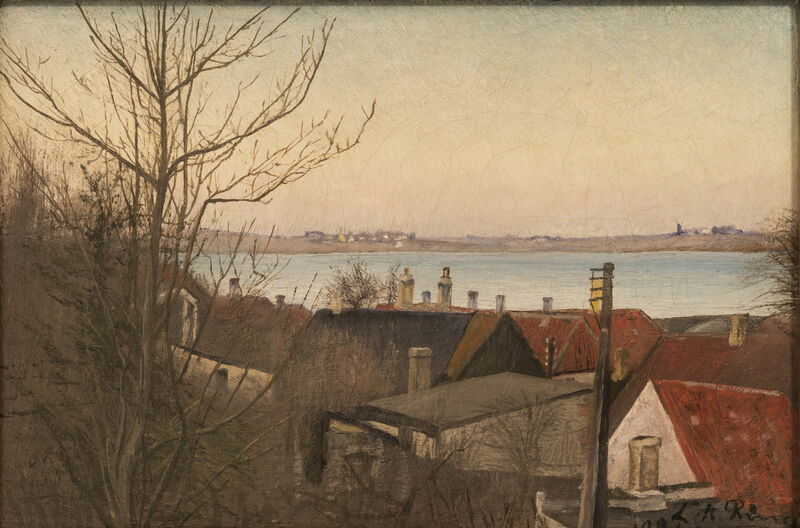 Laurits Andersen Ring (1854–1933), View of Roskilde from Sankt Jørgensbjerg (1916), oil on canvas, 41 x 62.5 cm, Statsministeriet, Copenhagen, Denmark. Wikimedia Commons. 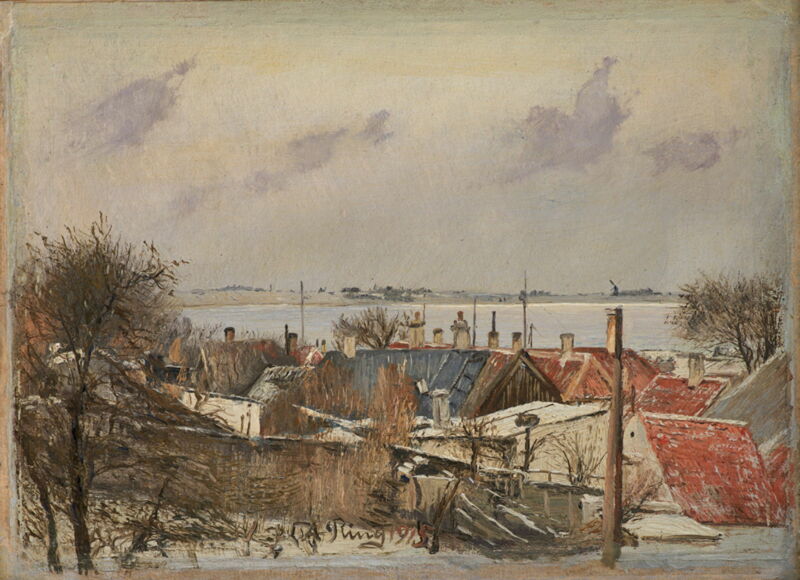 The following winter, Ring painted one of his finest landscapes, View of Roskilde from Sankt Jørgensbjerg (1916). It’s a dull grey day, with the snow lying on the ground still. Although here quite distant, the great cathedral dominates from its position at the top of the hill. In seemingly painting every single branch and twig on the barren trees, Ring has brought a fine, rhythmic texture to the foreground which extends right to the skyline. The detail below shows his rich vocabulary of textures in the trees, field, and buildings, which compensate for the muted colours. 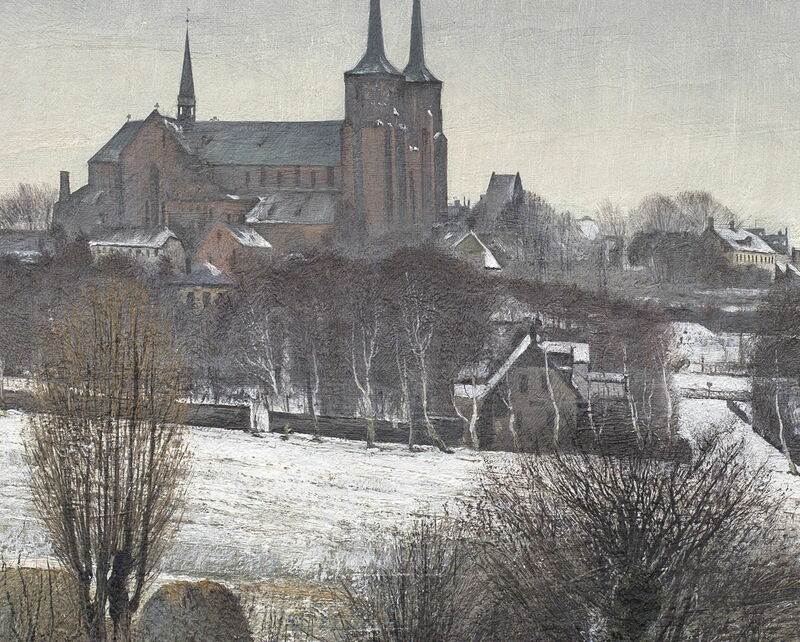 Laurits Andersen Ring (1854–1933), View of Roskilde from Sankt Jørgensbjerg (detail) (1916), oil on canvas, 41 x 62.5 cm, Statsministeriet, Copenhagen, Denmark. Wikimedia Commons. Laurits Andersen Ring (1854–1933), At the Old House (1919-22), oil on canvas, 81 x 102 cm, Nationalmuseum, Stockholm, Sweden. Wikimedia Commons. Ring seems to have worked on this full-length winter portrait At the Old House over quite a long period, starting it in 1919 and not completing until 1922. Laurits Andersen Ring (1854–1933), View of Sankt Jørgensbjerg and Roskilde Fjord (1921), oil on canvas, 20 x 29 cm, Statsministeriet, Copenhagen, Denmark. Wikimedia Commons. In 1921, he returned to his 1915 view, with another View of Sankt Jørgensbjerg and Roskilde Fjord. This again seems to have been painted in the winter, and the same windmill is seen on the opposite bank of the fjord. Sigrid Kähler, Ring’s wife, died in 1923 at the age of only 49. Their son Ole, who had been born in 1902, also trained as a painter, and followed his father in style. 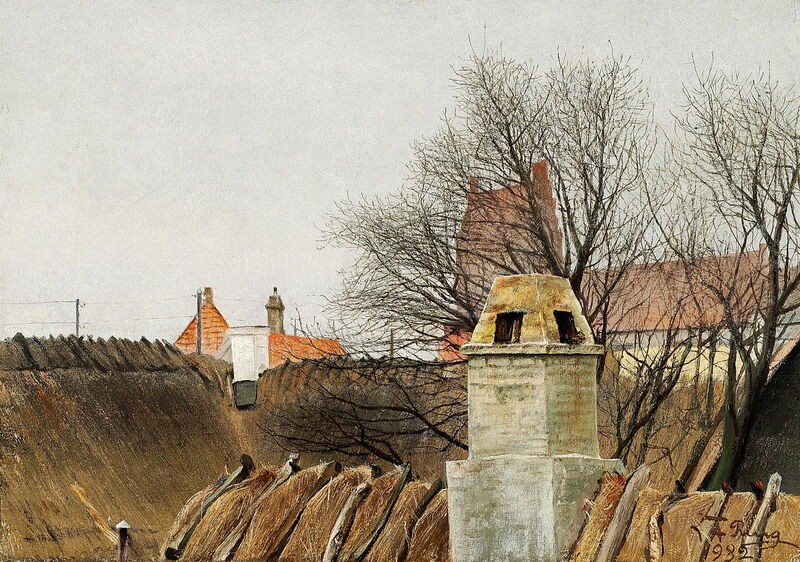 Laurits Andersen Ring (1854–1933), Ole Ring looks over Roskilde (1925), oil on canvas, 36.5 x 28 cm, Ordrupgaard, Jægersborg Dyrehave, Denmark. Wikimedia Commons. 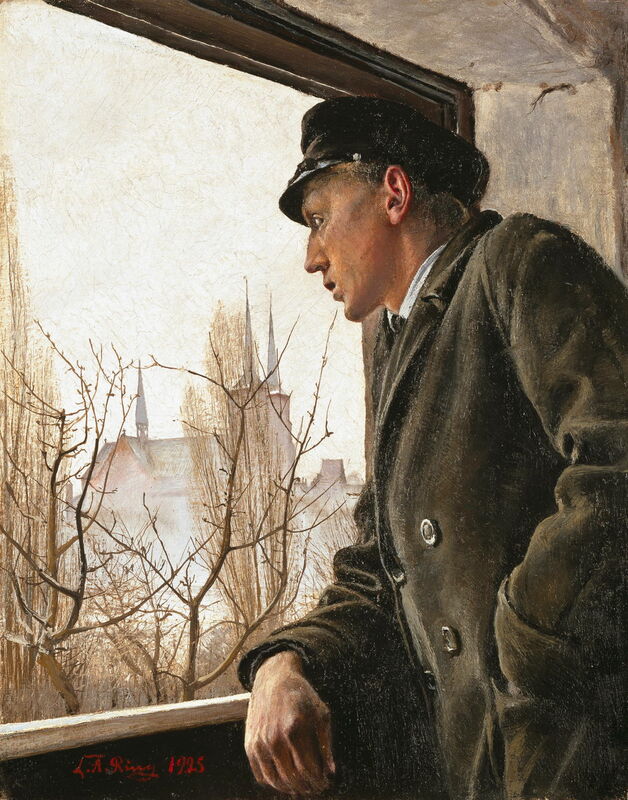 When his son was twenty-three, LA Ring painted him in Ole Ring looks over Roskilde (1925). This is reminiscent of Ring’s Young Girl Looking out of a Roof Window which he had painted in Copenhagen back in 1885, forty years earlier at the start of his career. I’m not sure where this was painted: it appears too close to Roskilde Cathedral to be in Ring’s house in Sankt Jørgensbjerg. It is also winter again. 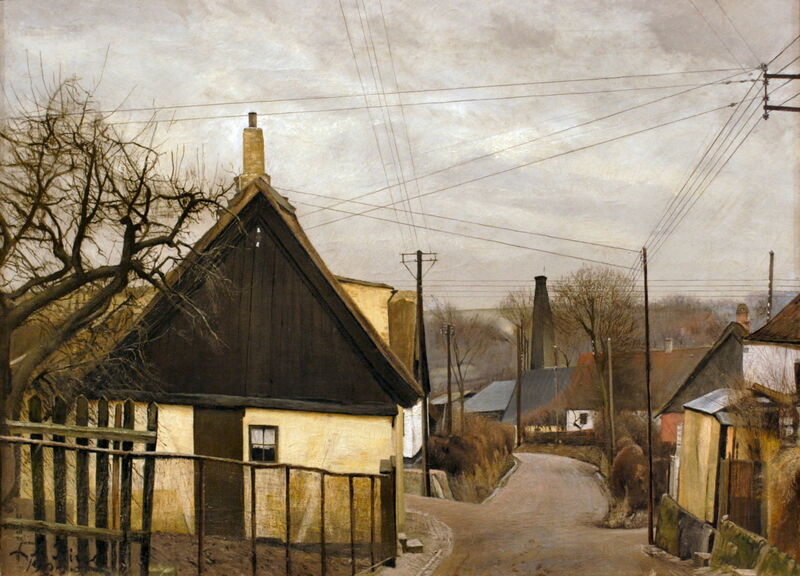 Laurits Andersen Ring (1854–1933), Brøndgade, Sankt Jørgensbjerg (1927), oil on canvas, 58 x 78.5 cm, ARoS Aarhus Kunstmuseum, Aarhus, Denmark. Wikimedia Commons. Brøndgade, Sankt Jørgensbjerg from 1927 shows the main street in what was shortly to be absorbed into the growing city of Roskilde. Off to the right the lands drops down to Roskilde Harbour and the fjord, and the cathedral is behind the viewer’s left. This district has now become one of the more sought-after residential suburbs. 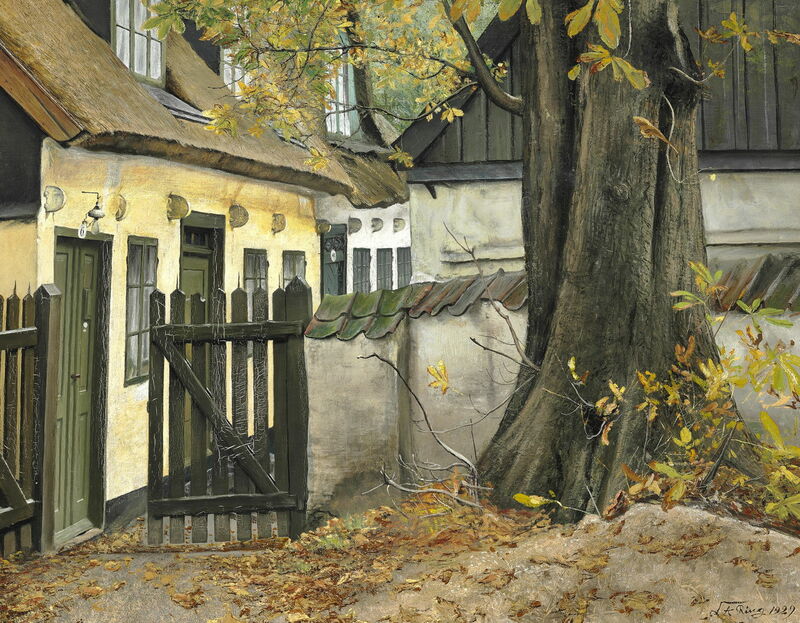 Laurits Andersen Ring (1854–1933), The Old Chestnut Tree at the Gate (1929), oil on canvas, 67 x 85 cm, Ordrupgaard, Jægersborg Dyrehave, Denmark. Wikimedia Commons. In the autumn of 1929, Ring painted The Old Chestnut Tree at the Gate. Laurits Andersen Ring (1854–1933), Spring Day at Køge (1931), oil on canvas, 20 x 32 cm, Statsministeriet, Copenhagen, Denmark. Wikimedia Commons. Spring Day at Køge from 1931 was painted at this town which is south of Roskilde, on the coast opposite southern Sweden. The last of Ring’s landscapes which I have found is another View Over the Roofs at Sankt Jørgensbjerg, Denmark, from 1932. By this time, Ring was 78, still a superb artist with great precision in his detail of the leafless trees, and in the texture of the thatch. The church seen behind the trees is that of Sankt Jørgensbjerg, and this view is from the artist’s house. Ring died in Sankt Jørgensbjerg on 10 September 1933. His biographer, Peter Hertz, wrote that his still waters ran deep – something as true of his life as his art. Posted in General, Life, Painting and tagged Andersen, Brendekilde, Denmark, Kähler, naturalism, painting, realism, Ring. Bookmark the permalink. Can you upgrade or repair a Mac with a T2 chip?